I’ve been a total freak the past twelve months for foreign artists, often from the “third world” — during the sixties and seventies — playing original music as processed through a distinctly American filter. A number of the best finds have been on various compilations, both in and out of print, meticulously put together by obvious music fanatics. It’s really easy to get caught up in these. The backstory is typically the same, no matter if the artists in question are from Ethiopia, Lagos, or South America: American Folk, Soul, Rock & Roll, Jazz and R&B are heard through the radio and assimilated into the indigenous culture’s existing musical framework and fabric creating an altogether unique sound. 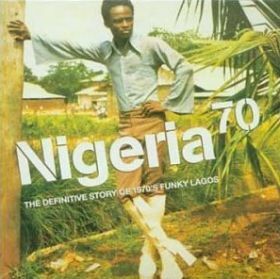 Lately the compilation that has caught and held my attention is Nigeria 70: The Definitive Story of 1970’s Funky Lagos. I could easily devote a dozen posts on the Drunkard strictly devoted to the various artists and songs featured throughout the comp. Maybe one day I will, but today have a listen to Bongos Ikwue’s “Woman Made The Devil.” If you’re anything like me, this will be be on repeat. + Check out tunes via the always impressive eMusic: 25 Free MP3 trial offer. + Visit The Hype Machine for additional MP3s. Damnit! This track is so fantastic on sooooo many levels…..brilliant! Great find, and the album looks worth possessing for its cover alone. But the lyrics ? – “God made a man/ and man made a woman/ but a woman made the Devil/ and we’ll throw her out through the window”… Please. What seems mere saloon room whisky machismo coming from Merle Haggard, sounds positively chilling when you consider Nigeria’s present “tensions” and the fact that it is immediately next door to both Uganda and Rwanda. I can all too easily imagine Kofi Anan bopping around to this in preparation for some media junket while he dismissed the Canadian UN forces request to seize the horded machetes before things got really “out of hand”. What a prize turd. I am so universally put off by anything that faintly whiffs of World Music that I instinctively recoiled at this post. Then I listened to the song. Then I ate my words! ib: WTF? While I won’t defend the lyrical content, I feel compelled to point out that Afrobeat was and is the soundtrack to the resistance against the military juntas, poverty and oppression that have long dominated the lives of ordinary Nigerians. And Nigeria is “immediately next door” to Uganda and Rwanda just like Colorado is “immediately next door” to New York State. In fact, the Rwandan genocide was laregely fuelled by the exhortations of the junta-controlled media; while Afrobeat, especially as practised by Fela Anikulapo Kuti, has always preached tolerance and understanding. In other words, the only turd here is your ignorant and bass-ackwards comment. It may be, but the sodding thing is still seventy five!!! quid on Amazon and as such there is little prospect of my buying it anytime soon. 2nd hand shops probably a better bet.